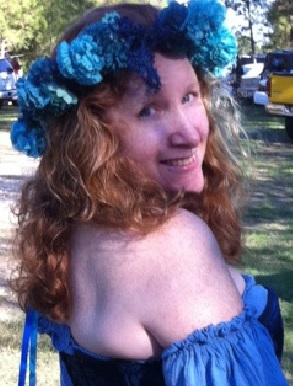 Feral Moon: Current PSKs with an Additional Bonus Oil! Current PSKs with an Additional Bonus Oil! EXCITING BONUS for ordering any PSK that is in stock now! 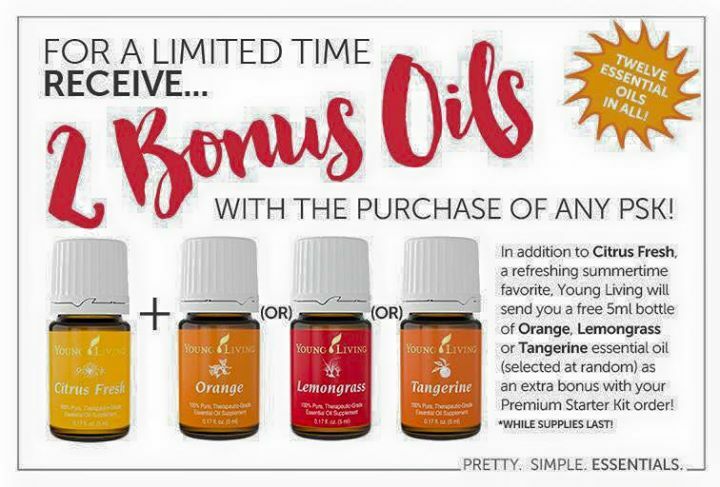 With the purchase of any of the current Young Living Premium Starter Kits, you’ll receive a free 5-ml bottle of Lemongrass, Orange, or Tangerine essential oil! (One free oil will be selected at random and included as a bonus with your Premium Starter Kit). Plus, Young Living is offering the opportunity to order your favorite current Starter Kits with no limit! While supplies last, you can order any current Starter Kit in any quantity and take advantage of the kit's collection of essential oil samples and business tools designed specifically for new members. 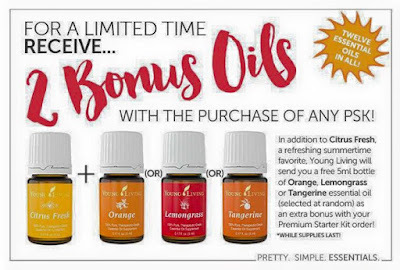 This limited-time promotion starts today at 6 pm EST and offers you the last opportunity to purchase this unique combination of popular, versatile essential oils. It will run only while supplies last or until the launch of our brand-new Starter Kits in June. Log in to Virtual Office and get yours while supplies last!